Personality Tranxport Professional v2.1, from Tranxition, differs from the wizard-style migration tools I’ve discussed so far. PT Pro runs from a server and stores personalities in a central repository. PT Pro’s installation loads the client software and the personality repository to a folder on a network server. By doing it this way, an administrator’s ability to manage the migration of multiple systems is greatly enhanced. Since the locations are well known to the administrator, they can easily automate the process using scripts or software-distribution tools. From a workstation, you then connect to the server and run the client setup program. PT Pro is a single interface that gives you access to both the extraction and insertion of personality data. PT Pro uses a Windows GUI interface. 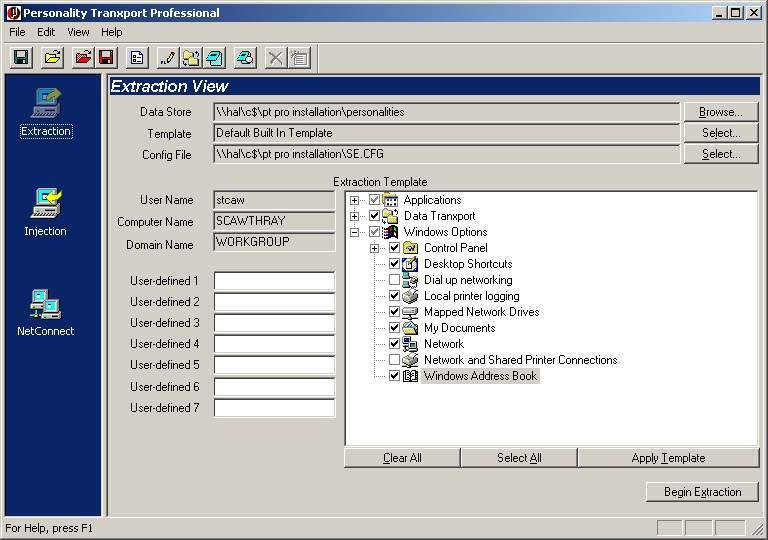 PT Pro transfers a broad set of items, including the desktop and control panel settings, application settings for the most common business applications, network connectivity, Internet and e-mail, and documents and data files. It includes rule-based file movement, giving you tremendous control over what files are moved and where they’re sent. PT Pro can migrate these settings between computers, even if they have different versions of Windows installed. The settings, which are extracted and stored in the personalities folder on the server, are listed in the client tool on the insertion page. This list allows you to identify your profile by user name, computer name and domain name. Also, PT Pro provides seven user-defined fields to help further group and identify your personalities. Once a personality is extracted, it can be inserted onto a fresh install of Windows via the client tool or by using the NETCONNECT utility. NETCONNECT creates an image that can be used to insert a personality into a computer that isn’t currently connected to the network. NETCONNECT allows you to transfer the personality information from one computer to another and extract it without access to the client software on the network server. This is a convenient feature for administrators who need to migrate remote or mobile users who may not want to wait for files to transfer over a slow connection. Unlike PC Transplant Pro, NETCONNECT uses a separate executable to extract the personality files on the destination system. Since personality files can be very large depending on how many settings and files are being migrated, it’s often faster to use a network connection, but the offline features are a nice to have when you have no choice. PT Pro provides a command-line interface that allows automated installation and uninstallation of the client and extraction or insertion of personalities. These advanced features make the migration of multiple systems very easy. PT Pro uses a configuration file on the server to tell the client software what settings it can migrate. Also, when the client is running on the server as a shared application, new or updated configuration files are instantly available to all instances of PT Pro once they’re installed. This can save a lot of time if you manage hundreds or thousands of client computers. PT Pro is a powerful migration tool obviously focused at enterprise administrators, with its centralized management of personalities and rules-based controls. PT Pro is more complicated to use than the wizard-based migrations tools, but not overly so. It’s best suited for IT professionals or service providers who need to migrate large numbers of systems and need a high degree of control.